Harrogate Town have announced that eight members of their first team squad will depart the club at the end of their existing contracts. 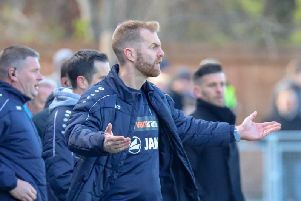 The National League North outfit are making preparations for life as a full-time professional side in 2017/18, and a large turnover in personnel is expected. Leaving the CNG Stadium this summer will be captain Danny Ellis, fellow centre-half Luke Shiels, striker JP Pittman, midfielders Andi Thanoj, Joe Colbeck, Tom Platt and Wayne Brooksby, and goalkeeper Chris Elliott. A statement released by the club said: “We would like to place on record our sincere thanks to all of the players who are moving on for their contribution to the club and wish them all the very best in the next chapter in their careers. Central midfielder Warren Burrell and winger Joe Leesley are among the Town players to have penned new deals.